We have been continuing our research and work with Nickel-Iron (NiFe) batteries. NiFe batteries are non-toxic, extremely durable, and very tough. Lead-acid batteries are fragile, toxic, and short-lived. Lead-acid batteries dominate the off-grid market, and have largely destroyed it because they die so quickly. From the perspective of how we do things at LEF, power density and recharge time are irrelevant. At LEF, we store energy in various ways that allow us to minimize the need for stored electricity. We store water in pressurized tanks, so we don’t have to run a water pump at night. Our buildings have massive thermal mass, so we don’t have to run a heating system at night. We will pump irrigation water through the house while the sun is shining, getting free air-conditioning in the summer from solar pumped irrigation water. We use high voltage DC motors when the sun is out. We use stored electricity for lighting, nothing else. Our NiFe batteries charge all day long from our solar electric panels. It would not matter if their recharge times were slow or if their power density was abysmally low. Big, cheap batteries would be just fine. A few people have tried “out in the garage” experiments with homemade NiFe batteries. The basic ingredients — nickel, iron, potassium hydroxide (aka potash) — are easily available. We have been looking over Edison’s original manufacturing processes, as well as the documentation of various homemade NiFe attempts. From his shop in Pittsburgh, Eddie is going to continue the research and try to build low-density NiFes in mason jars. We are not so presumptuous as to imagine that we could outsmart the many well-endowed entities that have worked on high-tech batteries over the years. But it is very possible that low-density NiFes have been ignored simply because there is no immediate profit to be made. If we can make cheap, low-density NiFes, it would be revolutionary. A very small solar electric panel could be wired straight to the batteries. Small houses in villages all over the world could have light with small LED flashlight bulbs designed to run on low voltage. That could be a cheap, very durable way to provide lighting to millions and millions of the world’s poorest peoples. Wish us luck. If the mason jar NiFes fail, we will continue our overseas efforts using purchased NiFes. Solar boiler is operational, but not adequately effective (yet). New shop in the background. in our definition of sustainability. Finding tools and machines that are accessible to most of humanity is not easy. At LEF, we are using a combination of solar cookers (parabolic and ovens), and wood stoves. Our rocket stoves are very efficient, using about one-tenth of the wood of an old-fashioned wood cook stove. There are numerous organizations working to spread rocket stoves around the world. That’s a good thing. The rocket stoves work, but they are an outdoor technology. They are a fire hazard. They mean that some ash and soot get into the food, and some smoke gets in the face of the cook. We built a biogas system at LEF a few years ago. (Biogas = methane = natural gas.) It worked, but there are limitations. The gasifier needs to be kept warm. In cold climates, sometimes they are buried. It needs to be of considerable size. It needs to be fed biomass each and every day. Seeing the limitations of biogas, we have built a prototype solar boiler. We designed a tracking collector that followed the sun, but decided to use a simpler trough system that needs no tracking. The collector reflects light onto a pipe which contains water. The water boils and the steam collects in a storage tank. The steam could be then piped into a steam-jacket kettle in the kitchen to cook our food. Cooking would be as simple as opening a valve leading to the kettle. We have been making solar steam, but so far, not enough to make it an effective heat source for cooking. We have some design modifications under way that should improve performance substantially. At LEF, we live with these technologies. We are currently eating small amounts of ash and soot in our food almost every day. Such is unavoidable when cooking with wood, and unacceptable in the long run, especially for our kids. The fact that we live with the technologies we espouse gives us a very different perspective than just experimenting with them. Another advantage of developing the solar boiler is that we need the exact same parabolic trough setup for a solar ammonia ice maker, a super low-tech refrigeration system. We have thus given ourselves a head-start on that project. And we decided we are also going to look at biogas again. It could be a good bridge fuel for times when the weather does not support the solar boiler. Can we do it and still keep it simple and economical? Methane is a potent greenhouse gas. Can we control leakage? What is the impact of that on a larger scale? We will be seeking to answer these questions in the coming months. The Twin Oaks Community Choir performs at the 50th Anniversary. Twin Oaks fiftieth anniversary was last week. I didn’t go. My friend, Aurora, who was there told me that Rudy, one of the Twin Oaks founders, spoke and said that when Twin Oaks was founded (in 1967), they thought a revolution was possible in their lifetime and one of the purposes of Twin Oaks was to show how people could live after the revolution. Another founder, Kat Kinkade, wrote (in her book, A Walden Two Experiment): “When we first came here we knew nothing of farming or any other way of making a living, other than working for wages in the city. Some of us had never even done that. What we did know is what kind of world we wanted to live in. And, slowly, the influence of Twin Oaks began to create that kind of world, at least on a communal level. In 1974, two more communes started. Around the same time, at Twin Oaks, they were having problems with getting more people than they thought they could support. Kat Kinkade tells the rest of the story in her book, Is It Utopia Yet? “I would gladly have lived in a tent, eaten in shifts, and built sewage treatment on borrowed money, in order to see Twin Oaks answer the challenge of that supply of potential members. I saw that lineup at our front door, people people eager to join, possibly hundreds of them but certainly dozens, and my response was a whole-hearted welcome–more than that, an excitement, a sense of grabbing history by the tail, a promise of a future community on a scale approaching Walden Two. East Wind, like Twin Oaks and Sandhill, continues to this day. But Kat left East Wind after five years, spent four years working in Boston, and then returned to Twin Oaks. “It took eight months to accomplish this. Two other communitarians, Gordon and Ira, joined me in an informal committee to get the new group off the ground. I’ve quoted a lot from Kat Kinkade, and she might have exaggerated her importance in the founding of all these communities, but it seems clear that Twin Oaks directly influenced East Wind and Acorn, and indirectly Sandhill. When I was at Acorn, I found out things did not go smoothly from the founding. Apparently, at one point they were down to six members and later went down to two members. (Acorn currently has almost thirty members and is thriving.) When I asked someone who had been a long time member at both Twin Oaks and Acorn how Acorn had survived, I was told: “Two things: Ira and Twin Oaks.” Ira Wallace is amazing and determined, but Twin Oaks, having been instrumental in founding Acorn, was not going to let it die. There are now three newer communes near Twin Oaks and Acorn and, although each of them has been struggling at times, I feel confident that they will make it, because they all have the support of both Twin Oaks and Acorn. Then there was the Dandelion community in Kingston, Ontario, which was influenced by Twin Oaks, and founded in the 1970s and disbanded around 1990. I would love to have the story of what happened there. Nevertheless, Commune Life has been able to have pieces on two current Canadian income sharing communities, The Common Unity Project and le Manoir. And there are a bunch of new income sharing communities in the US. There’s Oran Mór, which is near East Wind in southern Missouri, and the Stillwater Sanctuary/Possibility Alliance, near Sandhill Farm in northern Missouri. And there is Compersia, in Washington, DC, which just celebrated its one year anniversary in March. It is the first community spun out of Point A, which is a project that was founded by some Acorn and Twin Oaks members. 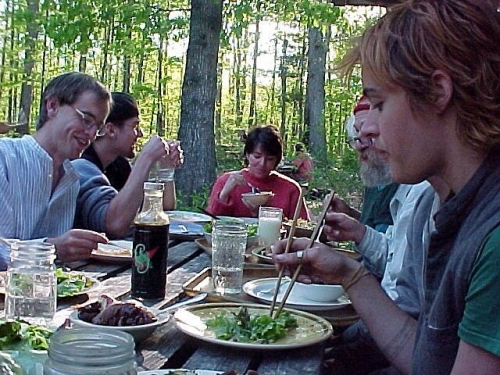 Le Manoir is an income sharing intentional community in Quebec. It supplies shelter (one shared house) and healthy and responsible food (mainly grown on site) to its members. It offers its members a different social environment to experiment new ways to live together and to develop their full potential, while having an impact on their extended community. The glue that sticks the group together is the commitment each of us takes toward the others, mutual aid, sharing and cooperation, all of which builds human relationship based on trust. A community of 12 to 30 members. We wish to keep a small scale group, in order to nourish the relation that links members to each other. In the meantime, it is enough people to bring diversity of ideas and interests. We all live in one shared collective house. Each of us has his/her own bedroom, but that proximity favors meeting the others. We eat together at almost every lunch and dinner. We share spaces, tools and objects, dreams and time, energy and competences, happiness and sorrow. That is what brings us so close to each other. We desire to co-create, to seek together. On the one hand, each one commits to the other, the community supports us, we embrace conflict and we create the space to resolve it. In the core of all conflict resolution, we place the respect for each other, gratefulness, and trust that each person does he or her best. On the other hand, we are there to help, encourage, comfort, and laugh our life with each other. We share the purpose to feel useful, and to care for each other in our personal paths. Safer space: Le Manoir intentional community has an anti-oppression goal. Work is done in order for the members and the people visiting to feel secure, to find support and allies, and to create a space where we can look at oppression questions. Different mechanisms may be put in place to deal with these, while paying close attention to their effects. We have a furnished tool box to facilitate communication and the maintenance of healthy and honest relations. For example, all our members are trained in Non-Violent Communication. Moreover, we regularly have empathy circles, validation or feedback circles, or restorative circles. People who request support in their conflict resolution process may find it with another member, a mediation committee, or a qualified person external to the group. Silliness, joy, playfulness, celebration and gratitude: We believe that these are essential conditions to be ALIVE! A sparkling and colorful time-space is looked after through games, music, dance, creative nights or celebrating mornings, adventure or cocooning, planned parties or spontaneous activities. We recognize life abundance and nurture the balance that allows our group to evolve in a healthy and inspiring world. Vive la vie! Our definition of social justice is the opportunity for every person to blossom and access their full potentialities. All human beings have the same rights, and this equality in rights has to be followed by practical equality in order for each person to participate to the world they want to create in an equal way, respecting their strengths and interests. We consider the fight against inequalities, the condemnation of discrimination in any form, the refusal of exploitation by one another, as integrated and coherent part of the process toward that ideal. A participative and non-hierarchical decision making process. The goal is to favor equal power distribution among the members, self-management and shared responsibilities. Our toolbox include consensus and sociocracy (consent). We share with anarchists self-management practices and direct democracy. Ya Basta! Income sharing by all members of the community. We define ourselves as anti-capitalists since we question private property and appropriation of profits by the governing class: this is the source of inequalities in our society. We recognize “one worked hour as one hour of work” as a basic concept. It is inspired by a feminist and egalitarian vision because, among other things, it includes invisible work (dish washing, cooking, caring). Each member’s contribution is done in hours, not in cash. This tends to avoid power imbalances related to economic capital. Social and political activism in the larger community (family, road, village, province, state, country, world). The choice to live in an intentional community doesn’t seek to create a little universe cut off from the rest of the world, a little paradise remote from human decadence. It is a political tool, a collective strength, a think tank and a team of militants ready to go into action to preserve nature and social justice. This can take multiple forms such as: critical analysis of current events, participation in protests, street theater, civil disobedience actions, letters of opinion, etc. We consider it our responsibility, as inhabitants of this unique and improbable planet, to protect and highlight its very distinctive character. As such, we aim not only to have a light ecological footprint, but to make sure the trace we leave contributes to proliferation of vitality, in all its beauty and diversity. The way of life we want to share is one that nourishes the relationship with nature we have as human being, and we consider the choice of living together as a way to apply more respectful practices to environment. The fact that our community is located in a quebec country region. Nowadays, agricultural fields are lost, transformed into luxurious secondary residencies for young retired people who import their suburban vision to the way villages are developed. To build our community there, and bring a different model, aims to counter these tendencies. We want to live closer to nature (country/forests) in order to keep alive our connection with her, and not only for the beauty of its landscape. We adopt a fashion style that’s very “retro”: simplicity! We desire to diminish our ecological footprint. To us, it means opting for “less goods, more connections”. It means we question our “real needs”. It means to seek to make, exchange, find, share what we need. It means to choose the sustainable option. We raise animals for their role in the growing cycle of our vegetables. We compost our organic wastes, we use only composting toilets, we integrate our water consumption into its natural cycle, because we want our lifestyle to reintegrate to its environment and its cycle. We are inspired by permaculture principles, we integrate into our practices analyses of our environmental footprint, 3RV rules and “convivial decrease”. We favor ecological construction and renovation. This includes reflection on the necessity to build, on the size of the rooms in line with our needs, on choices of materials that considers available onsite resources and the social and environmental impact of their exploitation, usage and end of life, and choices of construction methods that imply traditional or democratic/participative techniques. For us, autonomy means the freedom to choose. Our conception of freedom is intimately related to the principle of responsibility, and to the one of “power of oneself”: independence, sovereignty, auto-determination, self-sufficiency, self-governance. The autonomy we are talking about here is a group autonomy, and it refers to our collective capacity to choose our way of life. Food autonomy: We produce and transform a great part of what we eat. We garden in an organic way, gather fruits and mushrooms, we fish, hunt and trap. We buy as little processed food as we can. We don’t aim to produce absolutely all we eat, so we exchange our goods and services with local producers that share our values. Energy autonomy: We want to radically change our way of life in order to diminish our energy consumption. The simple fact of living together works toward that aim. We wish our main residence to be off the grid, in order to promote the most ecological source of power: the negawatt! We want to use various technologies to take advantage of renewable, free and accessible resources. In the medium term, we wish to be fossil fuel free. Economic autonomy: We run one or many businesses that generate revenues. We collectively own the means of production. It allows members to work inside the community. We are not employees anymore: we become workers again. Moreover, a self-managed business brings diversity of work in the community that broadens the range of experience and competences of its members. Unlike an anonymous job, our business, based on our values, contributes to building the world we wish to live in. Financial autonomy: We prefer to borrow small loans from friends and family than to contract bank loans. Ideologic autonomy. Our community is secular, which means that we consider that spirituality or religion choice is a personal one. We consider openness is an essential quality to develop a long-term sustainable community. Our aim is to have an impact on people and larger communities, promoting collective practices and ways to live and think that favor social justice and protection of nature. Thus, opening ourselves to others, ideas, differences, share and enhance our perspectives with new ones, as long as getting involved, appears to us to be the way to go. We set up links with our broad community. We participate in what is in place, we get integrated, we “volunteer”. We want to create partnerships with groups and organisations on certain subjects. We want to serve the society and thus, our immediate community. We offer goods and services. Our community is open to the world because we throw ourselves into it. We greet visitors. We want our initiative to be known. We want other people to see/know how people live in an income sharing intentional community. We organise activities open to the public. We share tools, knowledge, competences and allow our neighbours to use the resources we have. Our community is open to the world because it allows each person to get involved and benefit from it. We want to allow each interested person to get involved into our project to the extent they are willing to. To reflect the diversity of possible collaboration types, and define rights and responsibility for each, we identify various types of “members”. Twin Oaks, in Virginia, celebrated its fiftieth anniversary this weekend. Here are some pictures from the festivities. Skylar paints picnic table in preparation for the 50th. Nina does repair work in Llano kitchen. Skylar replaces light switch and outlet covers. Christian repairs the ZK deck. We have taken some leaps this year towards our goal of a permaculture food forest and perennial plant nursery, thanks to a generous donation from The Cassandra Trust. What we are designing and building here on our property, we hope to be able to teach, inspire, and supply the means to do elsewhere. We have lots of good energy at LEF these days. Connor is making great progress on our our new you-pick berry operation and horticultural food growing. Gilgamesh is finishing out the new shop, which is now one of the most popular spots on site. How did we ever live without it? Misha is working on finishing out our main house. Deanna has brought our first bee hives to the farm and is setting up an herb garden next to the kitchen. We have been joined by Paula, who is taking care of our new crew of ducks. Bobby has been instrumental in getting the woodgas tractor running again. Eddie has built something that looks a lot like a solar boiler. Dan and Erica have moved into Magnolia House (1 mile away from LEF) with their kids Jesse and Mason. They hope to move to LEF later in the year. The LEF kids — Rosa, Nika, Sunnelin and Olan — are doing great. Life is very full at Living Energy Farm these days. We are working on a model of sustainable living that we hope can spread around the world. As we mentioned in the last newsletter, we had plans to use our package of sustainable technologies to support lighting and water pumping in a small hospital in Kenya. We were relying on support from some of the staff of other NGOs to travel there and provide information. Unfortunately, there are more people at risk of famine right now than at any time in the last 60 years. The African NGOs have their hands full. They have not been able to work with us on our project. Such is the ongoing price of climate change. We wish them good progress in their work. In the meantime, we have been networking with people and organizations that might help move this idea forward. Eddie, our technical intern at LEF, just left to return to Pittsburgh. He hopes to build an LEF-style community there. We have also had a couple of meetings with the New Community Project in Harrisonburg, VA. They have put together an amazing community of people around a neighborhood of houses that offer both an ecological vision and hospitality for people trying to get on their feet. We have a plan to take their main community house off-grid using the LEF approach. We will work on design and funding in the coming months, and begin work on reconfiguring their community house later this year or next. Tom Benevento is one of the lead organizers of the New Community project (Vine and Fig) in Harrisonburg. He has also done support work for sustainable development projects in Guatemala and the Dominican Republic. He will be traveling down there next winter. We will probably send someone to travel with him and assess the options for setting up LEF-style communities in the Dominican Republic. We have friends in Nicaragua with whom are discussing the possibility of setting up similar communities there. Millions of people around the world do not have access to electricity, or farm traction. The integrated village renewable energy systems we have at LEF are, we hope, both sustainable and economically viable. As we spread this model, we intend to advocate an ideology that holds the Earth as sacred. We hope that our model, once more people understand it, will be able to spread on its own. Do you have friends in non-industrial countries? We are looking for people who have connections in communities where establishing LEF-style energy systems would be welcome. Such communities would need to have a sufficient level of social organization to be able to take advantage of energy supplies that tie numerous households together. Do you want to help us spread this model? Please talk to us. Living Energy Farm is a project to build a demonstration farm, community, and education center in Louisa County that uses no fossil fuels. For more information see our website or contact us at livingenergyfarm@gmail.com or Living Energy Farm, 1022 Bibb Store Rd, Louisa VA, 23093. Donations to the Living Energy Farm Education Fund are tax deductible and can be made via our website.